Kundalini is the power of pure desire within us,a motherly and soothing spiritual energy,which lies dormant at the base of the spine in the sacrum bone in three and a half coils. 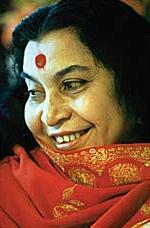 "She is your individual Mother.How can she harm you?She knows everything about you and is anxiously waiting to give you your second birth" explains Shri Mataji Nirmala Devi.The ancient civilizations knew that in this bone resides a sacred energy and that's why called it the sacrum bone. To the Western mind Kundalini may appear strange but fortunately,there is a familiar symbol of it in Western culture.The symbol for medicine and a common logo on ambulances is the caduceus. Caduceus is a wing-topped staff,with two snakes winding about it,carried by Hermes,given to him ( according to one legend ) by Apollo.The symbol of two intertwined snakes appeared early in Babylonia and is related to other serpent symbols of fertility,wisdom,and healing,and of sun gods.This is the symbol representation of the Kundalini in Greek mythology. Hermes, in Greek mythology, messenger of the god Zeus and of Maia, the daughter of the Titan Atlas. As the special servant and courier of Zeus, Hermes had winged sandals and a winged hat and bore a golden Caduceus, or magic wand,entwined with snakes and surmounted by wings. The caduceus' central rod represents the central column similar to the spine in the physical body called sushumna.No surgeon will find this sushumna as it is part of the subtle body.The sushumna,our caduceus' rod,parallels the spinal column from the base of the body to the base of the skull.Just as the spinal column is a hollow structure that protects the spinal cord of the central nervous system,so the sushumna is a hollow structure that offers an ascending tube for the Kundalini,or light force and within it are three channels. The caduceus' two snake-like tubes,which spiral three and a half times each around the central rod,meet and cross at the sushumna in their ascent.They represent two side channels of the flow of the awakened Kundalini energy,called ida and pingla.The channel,ida,is identified with the leftside,negatively charged,feminine side of the body,ending above the right nostril and has characteristics of coolness related to the moon;whereas,pingala, is identified with the right side,positively charged,masculine side and ends above the left nostril and has characteristics of heat related to the sun.The two channels are also seen as connected to the sympathetic and parasympathetic nervous systems,which enervate the organs of the body.